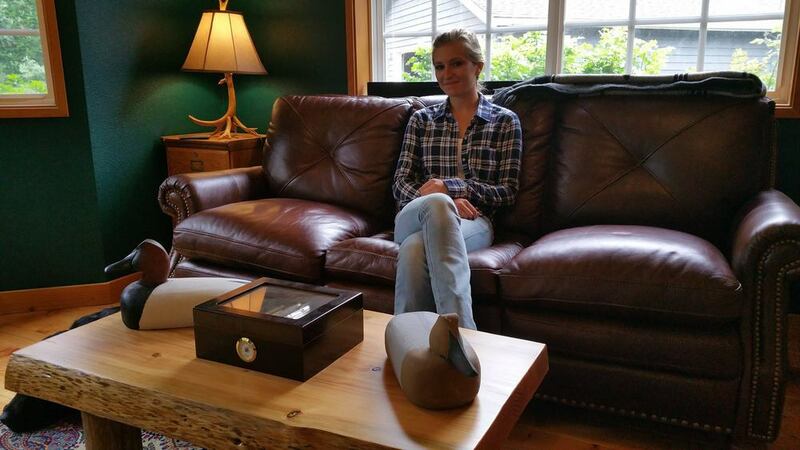 The Harts Lake Pioneer Lumber Company will provide you not only great furniture, but with an incredible personal experience. It is easy to simply go to Home Depot for all your project needs, but where is the sense of adventure in that? Our goal is to give you the opportunity to meet the tree that will become your furniture, and to see how your item is made. Our wood has a history. It comes from our family farm, Wilcox Farms, where we have been growing trees for over a hundred years. My dad and I have lived on the farm for our whole lives, and we love living here. We would enjoy the opportunity to work with you in accomplishing your project. I can’t believe I’ve been running this business for six years already! Most 24 year-olds don’t get opportunities to do anything like this. As I’ve been figuring out my life, it has been QUITE the ride, full of lessons and joy. Unsurprisingly, I am always busy, so if you are interested in a rustic table, counter, or bar cart, the sooner you contact me the better! I look forward to hearing from you, and as always, a big thank you to all of those who have supported me in this journey. Sign up with your email address to receive updates about our latest projects and adventures! It isn't every day that I get a project that doesn't have a very specific plan. The farm wanted an accent wall for the office, and I was just the person to make one. These maple boards were from logs my dad and I cut a year ago. They feature the unique shapes and texture that comes with having so much of the live edge. Stained dark and then screwed into some uprights, this is the first thing that visitors to the farm will encounter when they enter the office. Oh, and the counter top in front is also not too shabby! During my spring break, Port Blakely delivered a load of logs to the farm. Dad and I only had TWO DAYS to saw them and get them to the kiln. Luckily, we both know how to work hard under pressure. For the dimensional lumber we used to construct the base of the kitchen table, we run it through our planer to smooth and straighten it out. We found out the hard way last summer that warped boards are hard to work with. Ya live and learn I suppose! We provided the desk and table tops for Port Blakely, but the bases of the desk and meeting table were constructed by another company. For this project, my dad and I learned how to joint the wood. 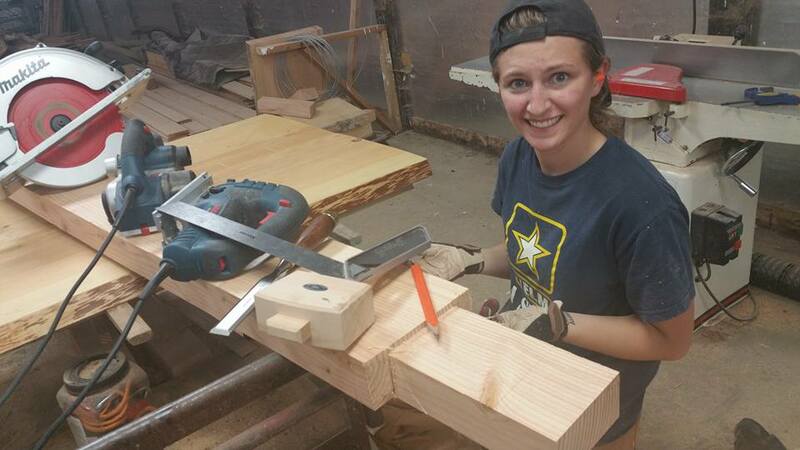 In this picture, our good friend Cort is showing my dad and I how to use the jointer we bought a few months ago. This machine allows us to get the straightest cut possible so the wood slabs will line up perfectly. After we joint the slabs, we glued two of them together to get the full width we were going for. We bought some heavy-duty clamps and crossed our fingers that everything would work out right. It worked out brilliantly! Do some sanding, add some urethane and voila! Especially for these larger slabs, it is important to make them as level as possible. To do this, I use a straight edge to find out where the high spots are and then I use my belt sander to level it out. It takes a while, but hey - I like a good work out! 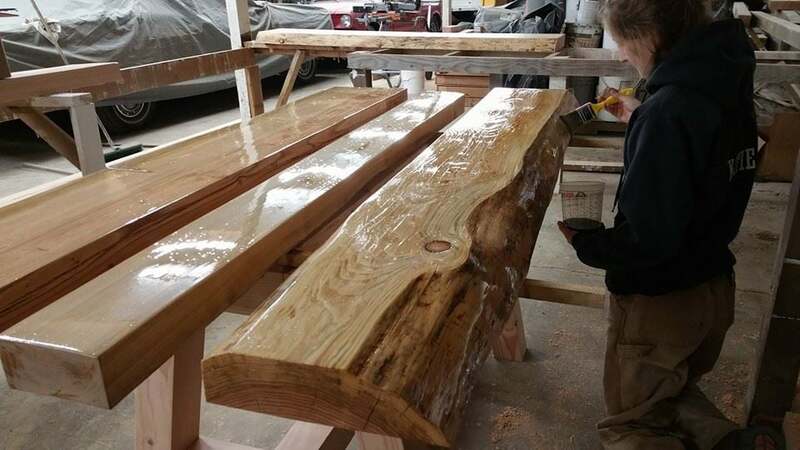 For the 13 foot conference table, we used a trestle and slab-style legs for the undercarraige. We had never done anything like this, so it was a learning expereince! The amount of tools it took to make the tenon at the end was unbelieveable. This is my "this is hilarious/ridiculous" look. Again, after a trial and error process, we figured it out! This is what the frame of the conference table looks like. I especially appreciate the way the dark wood compliments the lighter wood. To ensure that the legs stay upright and wouldn't fold, we used the trestle and two "keys" to lock it in place. The holes for the keys had to be cut at a percise angle and we spent the better part of a morning just drilling those two holes. WE assembled the conference table for the first time in our shop the day before we delivered it. When we finished, dad and I just started laughing and high-fiving! We couldn't beleive that we had really done it! It was a moment that I will never forget as long as I live. Luckily my dad is a boss, and he cut it perfectly! The finished product turned out to be a beauty. Not many people, especially at my age, can say they have made a 13 foot conference table. I am so thankful for this oppurtunity. This is the kitchen table we made as well. I love the way the table contrasts with the modern look of the kitchen. These tables now seem so small compared with the conference table!! The day after winter final exams, I made the journey home and immediately went to work with my dad. Wilcox Farms had ordered 5 separate items from us and I was only home for two weeks so we had no time to lose! The conference table and the lunchroom table were by far the biggest and most challenging projects we have ever attempted. However, with our new workshop, we had plenty of space to work. With 3 generations of our family helping out and some new tools, we were able to deliver some of our best products to the farm. Check out the slideshow below to see how we did it, and to see some of our final products! We completed our largest project yet! 1 lunch room table, 1 conference table, 1 desk, 1 sofa table, and a counter top. All of these were ordered by Wilcox Farms to spruce up the office. My dad and I also have a new workshop, which means we can work on big projects like these! Our first step was cutting all of our flitches down to the right length. It is amazing how many different saws are needed when cutting the slabs. For this project, we wanted to make sure the cuts were especially straight because they had to fit together to make table tops. We used a metal edge clamped to the wood to ensure the cut would be good. I have discovered that one can never have too many tools in this business! Sanding use to be the most time consuming part of the processes, but with this belt sander that we got last summer, I can get done with a slab like this one (20"x12') in a little over an hour. We often use three or four different types of sanders - like I said, we have a lot of tools around here! While I work on sanding all the table tops, my dad worked on assembling the frames of the tables. It takes careful measuring to make sure that the table frames are secure and won't wobble. 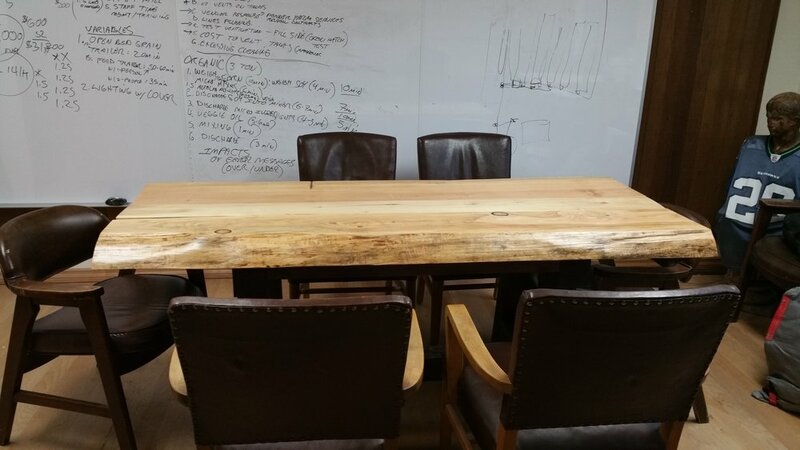 This is the conference table and we used Douglas Fir to make it. For all of these projects, we chose to use a tough floor stain because it will stand up to a lot of wear-and-tear and also gives the wood a more natural look than some other stains we have tried in the past. We usually do 2-3 coats, but we sand between each coat to ensure that it goes on smooth. This was one of my favorite projects. This is a desk or meeting table for my cousin's office. The two outside slabs are Douglas Fir, but the middle board is Maple. We have never worked with Maple before, so it was especially exciting to see how it looked after it was stained. The contrast between the woods turned out to be absolutly beautiful. Here is the desk after we assembled it. Talk about a conversation starter! 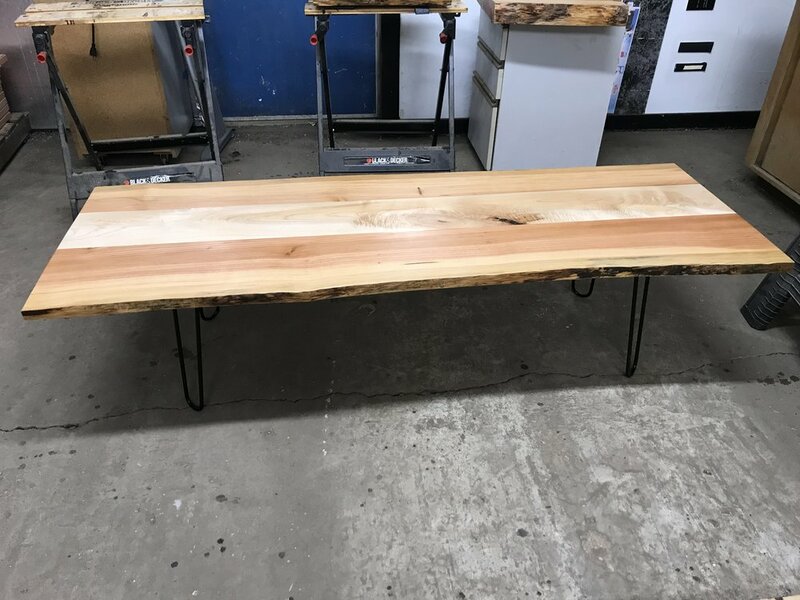 This is a lunch table that we made for the office. Again, it is all Douglas Fir, and we ended up staining the frame dark, because it contrasts with the table top. These slabs are so heavy that we had to wait to attach them to the frames until we had carried them inside the office. This is me (on my 21st birthday!) 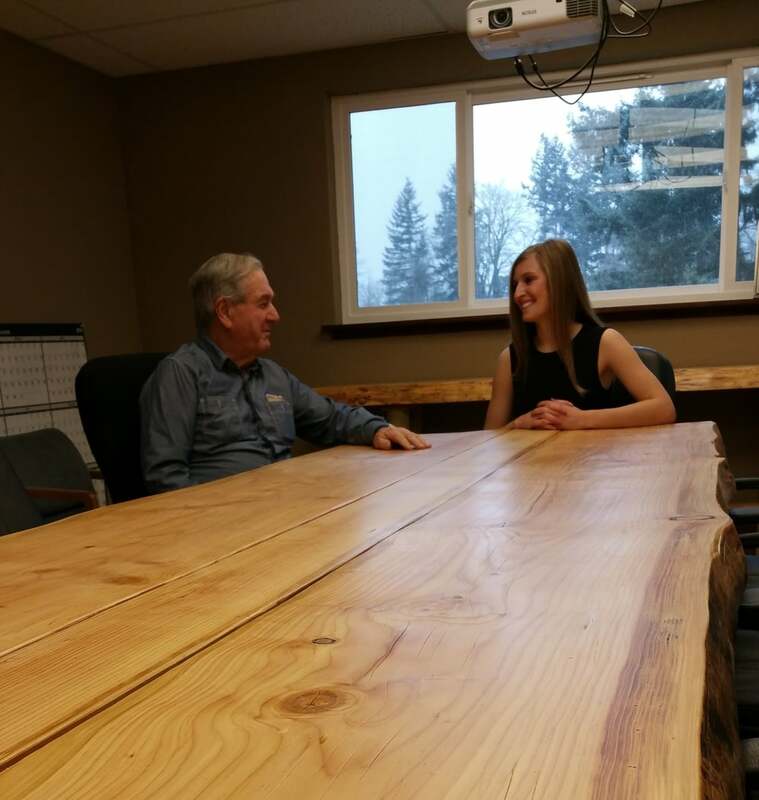 discussing business with my grandfather at the finished conference table. My grandfather is 79 but I am pretty sure he is Hercules. He helped my dad and I unload some flitches that were close to 300 pounds! As for the table, I can image some impressive business deals happening around this table in the future! This is the countertop that we installed at the front desk. It makes quite the first impression, does it not? 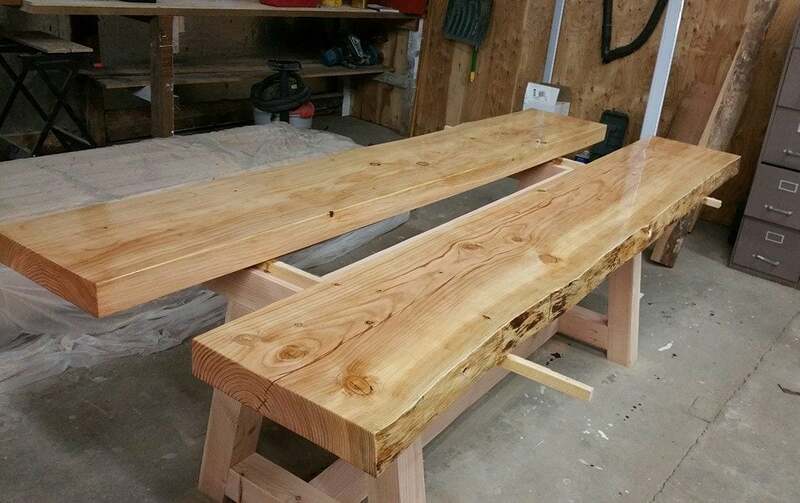 Our first customer was a friend who wanted to build a square family picnic table our of Cedar. Of course, we were more than happy to join him in working on his project. 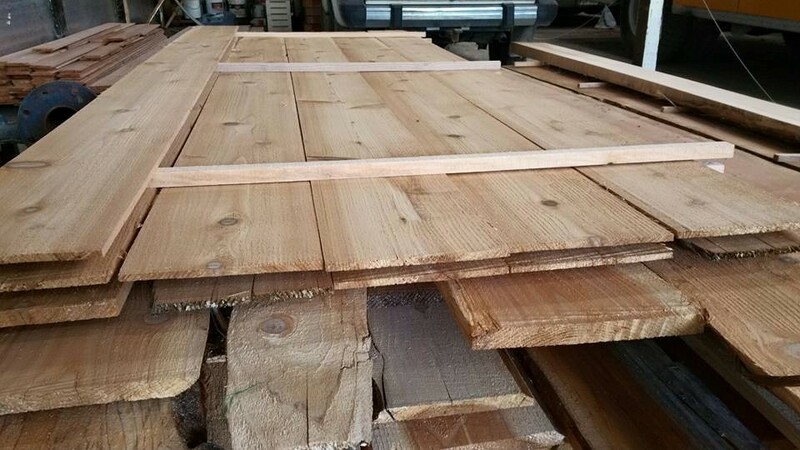 Obtaining and milling the Cedar was quite an adventure, and the pictures below tell the story of how we did it. 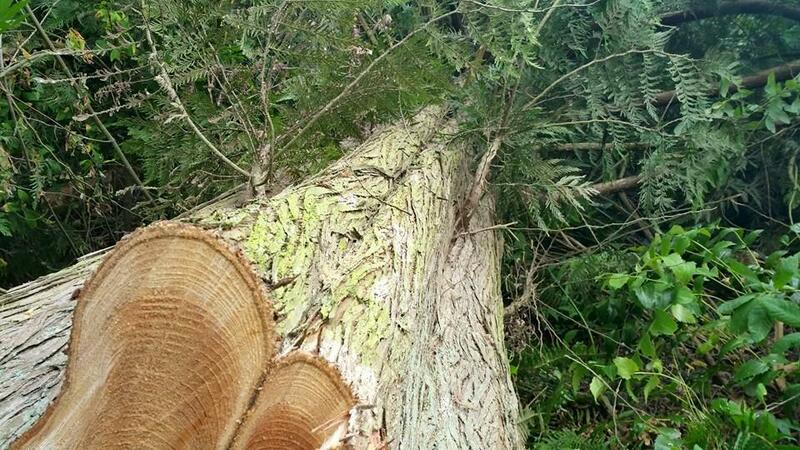 This is the Cedar we cut down! It was so huge that I wasn't sure we would be able to drag it out with our little tractor! Let me tell ya, we were in the thick of it out there! This is my dad cutting off the branches so we could drag it out without it catching on things. Here is my dad operating the fork lift, moving the cedar logs to the mill after we had dragged them out with the tractor. One thing I've learned about the Wilcoxs on the farm is that they can operate any kind of machinery, no matter how old or new. The ground the tractor was on ended up getting pretty torn up, and maneuvering the tractor became tricky at the end. My favorite part was when we were dragging out the last log. The way it was positioned meant that it could only be dragged out in a straight line, but I couldn't get that angle on the tractor. So my dad rigged up this pulley system, wrapped it around the stump, and attached one end to tree and the other end to the tractor. That way, it would be pulling it strait, but I could pull in a different direction! I was blown away by that ingenuity. This was our first time milling Cedar, and the grain proved to be gorgeous! We have a small amount left over in inventory for future orders. Here we are milling the Cedar. It smelled so good! I wouldn't mind milling Cedar everyday! Our lumber gets moved around a lot sometimes. From the forest, to the milling, and sometimes we move it back to our warehouse to dry. Lance likes to come and be a saw-dog with us. He is great company, but sometimes he tries to drag our lumber around because he thinks that they are just sticks for him to play with. Charlie's order needed specific lengths, and this picture shows my dad measuring a post so we can cut each leg at a consistent length. We took care to label the pieces carefully, to make sure we had everything Charlie needed. One of my favorite things about saw-milling is the fulfilling feeling you get when you see the end product. This was as far as we go on the project, but we can't wait to see the picnic table when it is finished! Charlie was sure excited to start on his project! We cannot wait to see how it turns out. One of our best sellers has been live edge coffee tables. It is a simple piece of furniture, but there is beauty in simple things. The table tops we coat in either a clear floor stain or we pour epoxy over it. For legs, we use old fence posts that we salvaged from the farm. There is history in this wood. I like to think that every table I sell to someone is like sharing a piece of the farm with them. Below, there are a few pictures of the table-making process. This is what Wayne's table started out like. Just a rough-cut 3 inch piece of Douglas Fir. It isn't uncommon for me to spend four hours sanding a table top. I start using 40 grit sandpaper and work my way up to 320! Pouring the epoxy is the trickiest part of the process. You have to spread it evenly, while attempting to make sure all the bubbles pop. This is the flitch after it was sanded. Looks a lot different doesn't it?! 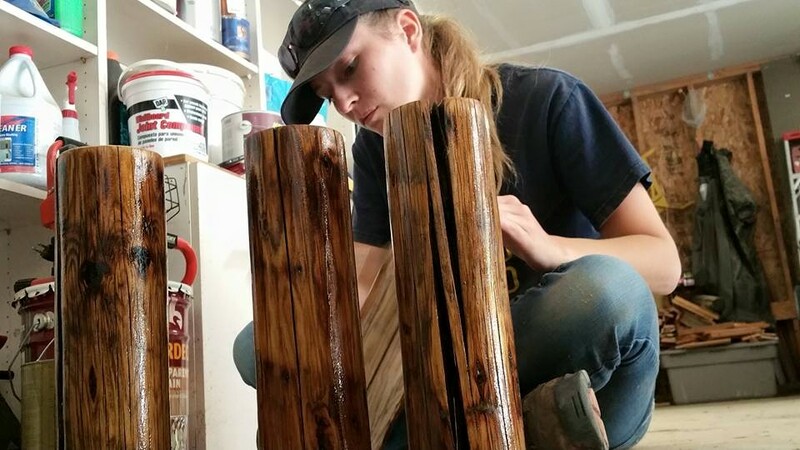 This is me adding a coat of stain to the table legs. These legs are actually salvaged fence posts that we found on the farm! Delivering the table to Wayne at Uncle Roy's Music shop was a lot of fun. Next time though, we will bring Lance! 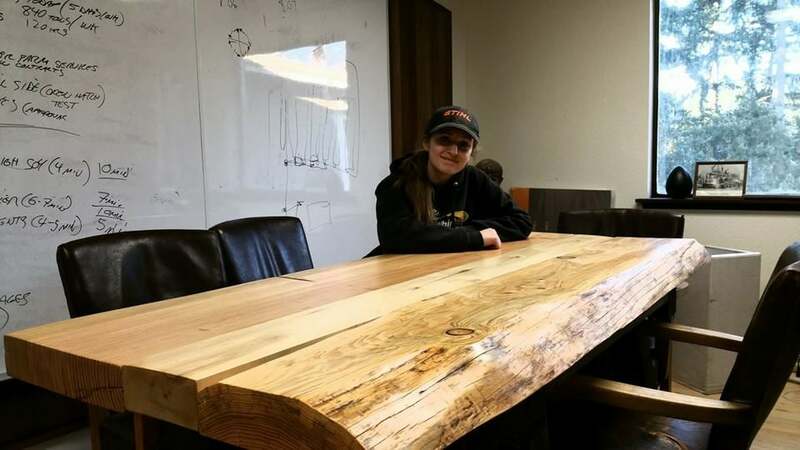 This 10-foot Douglas Fir conference table was by far the largest piece of furniture we have produced. 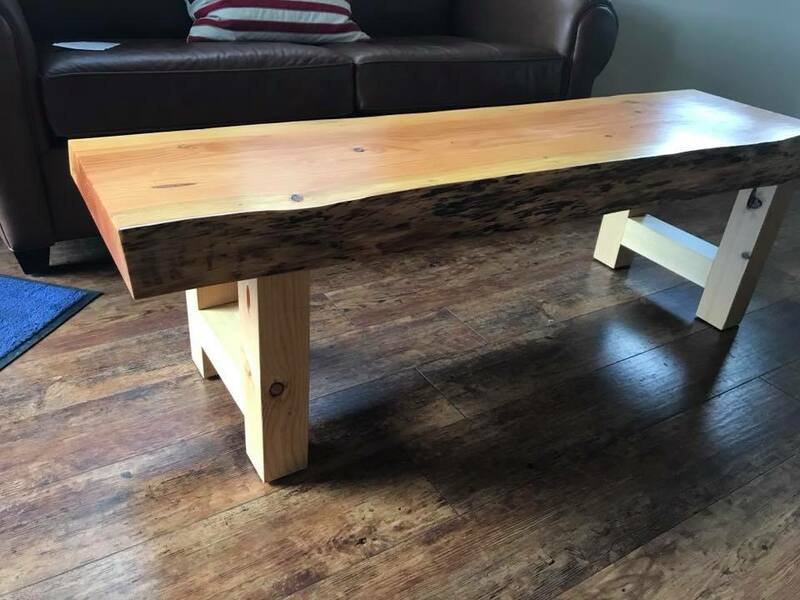 Made with two flitches (each featuring a live edge) and one plank down the center, this table gives a classy but rustic feel to any room. We can make smaller versions of this for dinning and kitchen tables as well. A whopping 13-foot conference table featuring a mortise and tenon frame went up 22 floors in an office building in Seattle for Port Blakely. Then we had to cut a hole in it for the audio/visual box. Talk about nerve-racking. This desk or meeting table was made for my cousin Andy. All of our products are unique, but this was the first piece of furniture we made using some Maple (the board in the middle) along with the Douglas Fir (the outside boards). I can only imagine successful meetings at a table such as this. Deviating from our usual live-edge style, this 8ft conference table was designed to match the old-school style of a downtown Tacoma building. From what I’ve heard, small talk is not hard when you have a conversation starter like this table! Talk about a power desk! This desk is made out of Douglas Fir and is designed to be paired with another, shorter desk to create an "L" shape. The dimensions can be customized to fit perfectly into any office. Beautiful office or awesome man-cave? In this case, it's both! This room features our Douglas Fir flooring and paneling, as well as some rough-cut moldings along the floorboards and ceiling. Having never installed a floor before, I would say my dad and I did a pretty darn good job. If you like what you see and want a room like this for YOUR home, shoot us an email! From floating shelves or desks, to 8 ft mantels. a live edge slab fits anywhere! The middle picture features how amazing our Maple takes a stain. The more I work with the Maple, the more I fall in love with it. Before we had even finished my Dad's office, he had a vision of how a Douglas Fir counter top would look in his bathroom. It features a natural edge which makes it feel like we're in the woods. Made for the lunchroom at the farm and at Port Blakely, this kitchen table easily fits in with the modern cabinets and appliances. The colors in the wood compliments the room and is large enough for a whole family to crowd around and share a meal. These coffee tables are truly a conversation starter! 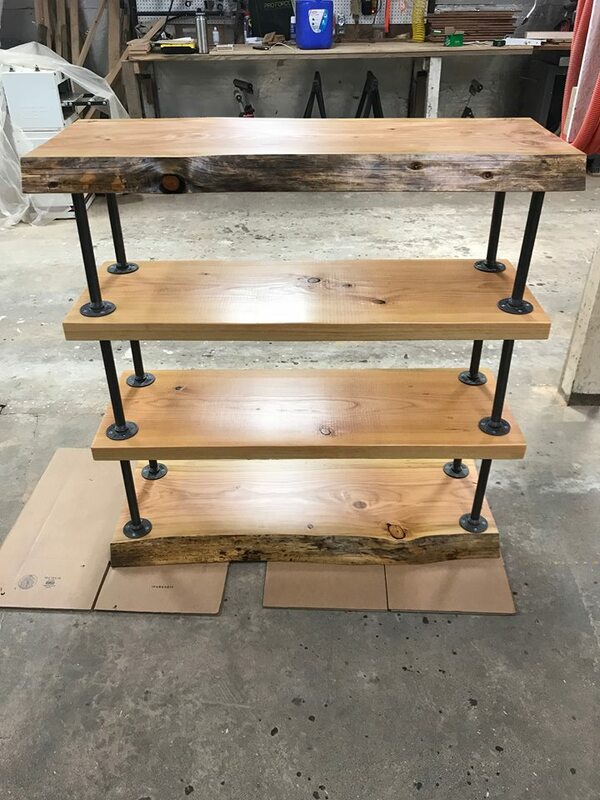 Each one is unique and the live edge gives a rustic look that anyone can admire. A standard table (20"x40") usually goes for $500, but we can customize to any length or height. The second picture showcases how mixing Maple in with the Douglas Fir creates an even more unique design. When I am away from home, this is the view that I miss the most. Wilcox Family Farms has been owned my family for over 110 years, and is where all of our timber comes from. 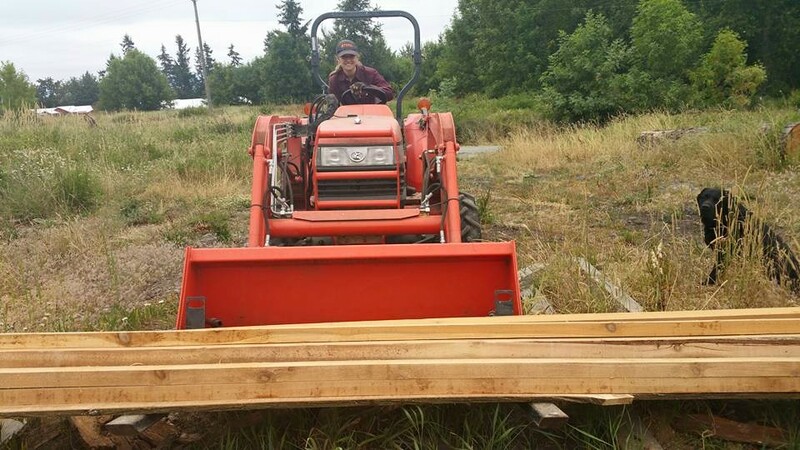 Our sawmill is also located on the farm, so we have a fantastic view while we work. This is me, Katie Wilcox, and I am 24 years old. 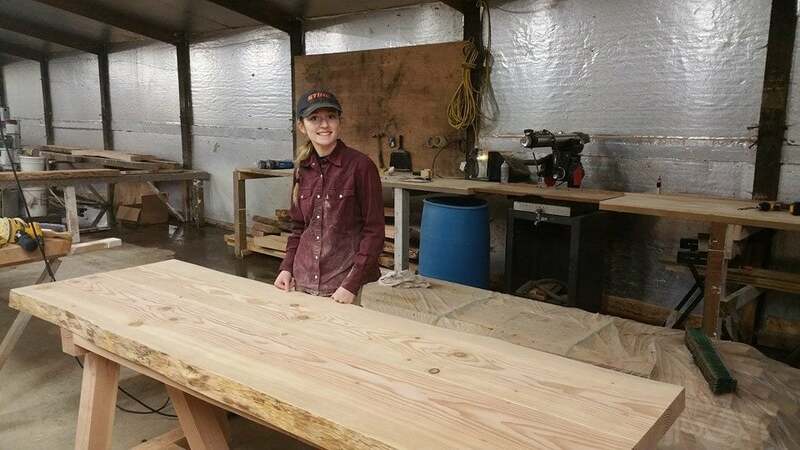 I took shop back in 7th grade at Yelm Middle School, but that was the extent of my woodworking experience before I started sawmilling with my dad. I don’t think 7th grade Katie would believe what I’m doing today! My dad, JT Wilcox, works at the capital as a Washington State Representative. He says running a sawmill is the best reality check. This is Lancelot, the saw-dog. He supervises our work to ensure the highest quality. He also tends to sit in the sawdust and woodchips, which we don't mind because it means he will smell great when we get back home! Lance is also quite active in politics - he even has his own Facebook page! - Update - Unfortunately our Lancelot passed away in 2017, but I can’t bear to take this picture down. Sign up with your email address to receive news and updates of our latest projects!